014 – Sync Solver App Saga; From Debilitating Back Pain to an App Helping You Get Healthy: An Interview with Jim McAndrew. LHD Podcast 014 – Sync Solver App Saga; From Debilitating Back Pain to an App Helping You Get Healthy: An Interview with Jim McAndrew. Good smartphone apps help solve problems. In this Podcast Interview, Jim McAndrew has a great story of how he solved his health problems. Inspired, he built an app that helps all of us do the same. Jim solved his health problems then built an App to help us do the same! Jim’s Journey from debilitating back pain to relief – just with lifestyle changes. Jim uses a Standing Desk to help eliminate his back pain and burn calories. How you can send a message to Fitbit and Apple telling them that your data is YOURS not theirs! In our modern era, anyone with an idea, skills and persistence can make a big difference! How Apple’s Health app and underlying HealthKit technology could save your life in the future. By making one simple change (cutting out breakfast cereal) Jim was able to lose 10 lbs! When the Doctors and Physical Therapists give up on you, it’s time to double down and make changes that bring about a positive lifestyle. What is QS (Quantified Self) data and how it can help you get healthy. Fitbit and Apple are in a corporate power struggle – What it means for you. Plus hear a great story about someone who overcame tough medical issues and turned his lessons into something that can help all of us. Is Fitbit’s opt-out drawing the battle lines against HealthKit? Download Sync Solver for your iPhone. LIFEHACKRDIET CONTENT SURVEY. Please take LESS THAN 2 minutes to fill out this SURVEY and win a MISFIT FLASH, activity tracker. We want to deliver content you want! Thanks! At some point in our lives, we will all have physical issues which will impact our quality of life. Some issues are best solved with the help of modern medicine. Other issues, we as individuals can be a huge part of the solution. By understanding our lifestyles through observation and with the use of “Quantified Self” data that we can generate with our activity trackers and smartphones, we can make changes that will improve our health and wellness. SUBSCRIBE Don’t forget to subscribe to the show on iTunes or Stitcher Radio to get automatic updates. LHD Podcast 014 – Sync Solver App Saga; From Debilitating Back Pain to an App Helping You Get Healthy. An Interview with Jim McAndrew. Paul: Welcome to this LifehackrDiet podcast. I am interviewing a fascinating guy. He is the founder and principal of Redshift Development which is a consulting company specializing in software that enables people to capture, analyze, optimize and automate the world around them and you will see how all this plays in shortly. He’s also the developer of a little app for the iPhone called Sync Solver and we are going to talk about that today. But more importantly, Jim is a husband and father of two little children. He is a regular guy with a really interesting story that relates to health and taking responsibility for your health and wellness. And also the quantified self movement which is just a general term for what we are all doing with our digital pedometers and our apps. And he made some very interesting lifestyle changes that yielded huge results and he did that partly from the data that he collected using his Fitbit in the Fitbit app. And we are also going to discuss why your data is yours or should be yours and it should always be yours. And I like to joke with Jim that he is my brother from another mother because we’ve traveled a similar path but have come to different conclusions or different answers that we have implemented so that we can help everybody else. So I would like to welcome to the LifehackrDiet podcast, Jim McAndrew. Welcome Jim. Jim: Thanks a lot Paul. Paul: So you have a wonderful story and it actually reads like a novel. I find it fascinating. We did a call last week and afterwards I was just spinning like – can you make a movie of this? It’s an amazing story. So let’s just jump right in. And why don’t you talk a little bit about the back pain that you had and what you discovered and the sort of changes you made? Jim: Yeah, sure. So starting back, it must have been 2011 or 2012, I was an avid runner. I would run 4, 5 miles a day and this kind of all goes in with using the Fitbit and doing all the quantified self stuff. But I was an avid runner and one of the biggest reasons I like to run was so that I could burn a lot of calories so that I could eat whatever I wanted to and I kind of thought about things mostly as just an energy equation, just however much I burn and then I can eat that much. And I kind of got stopped dead in my tracks when I started having just searing back pain going from my lower back all the way down into my legs. I guess it could be most closely identified with what people sciatica but it actually took me quite a while to get a diagnosis on it. At the beginning I figured I pulled a muscle or something and I just kept trying to play through the pain like my coaches used to tell me to do in high school. Paul: That’s a fun thing to do but not always the best answer. Jim: Yeah, exactly. So I went to my family practice doctor. She did some x-rays on me and we couldn’t really figure out what was going on. And eventually after about a year and a half of it I got fed up and it was I was like, “What could we do to figure out what is really going on?” She said well you need to go get an MRI. So I went and got an MRI, the spinal Institute near my house and they essentially identified that I have a bad disk between 04, 05 vertebrae that was degenerated and bulging and impinging upon my nerve right there. And it wasn’t that it was even impinging that much, it’s just in that area, when you have the slightest amount of pressure on those nerves it can just cause searing pain. Paul: Wow, nice bedside manner huh? Jim: Yeah. I mean it probably wasn’t that bad but something to that extent. Paul: Now I just need to interject for the audience. I actually had something like this as well for about a year. I was in really serious pain and I actually have video footage of me playing with my kids when they were younger and we’d be playing in the living room and I would be lying on my back playing with them because there was just no other way I could do it. Paul: And I went to my doctors and I am not 80, but I guess I was in my late 30s, early 40s that point and I have a little bit of a degeneration between the discs as well. Surgery wasn’t an option and they basically said, “Go to PT and see what happens.” And I did PT for a long time and they basically give up on me and I just continued doing all the exercises and almost to the day a year later I was a great. So just going back to the point of brother from another mother, we were going through the same thing. So please continue what happened after that? Jim: I relate to that. I mean because I have recently had… I have two young kids and it was really disheartening to just think that this was the new normal, like I wasn’t going to be able to play with my children, roughhouse with them and just be a fun kind of dad and it was pretty demoralizing. And I am not against Western medicine. I kind of try to take a more holistic approach to things. I mean obviously if you have the take drugs it’s fine, it can get you over the hump – I don’t really like to see that as a long-term solution. So I was looking for some more alternative things that I could do whether it be just stretching and exercising the yoga that you were talking about or I did acupuncture, did some chiropractic treatment, I got an inversion table so I was hanging upside down every day. Jim: Yeah, I’ll admit, my daughter got a kick out of that one. I will be the first to admit. I mean I engage in a lot of activities that aren’t necessarily awesome for people with bad backs. I mean I am an avid golfer, I like to do snowboarding so it’s kind of… I’m definitely using my back a lot, I understand that. So I kept trying to do everything, we bought a new mattress, it was just… We had tried all this stuff and it was just not… I wasn’t seeing really any results. It was just every three or four weeks I would have a flareup and I would sort of be out of commission for a couple of weeks and then it would just kind of go away and then I would just realize it was going to happen again another 3 to 4 weeks. 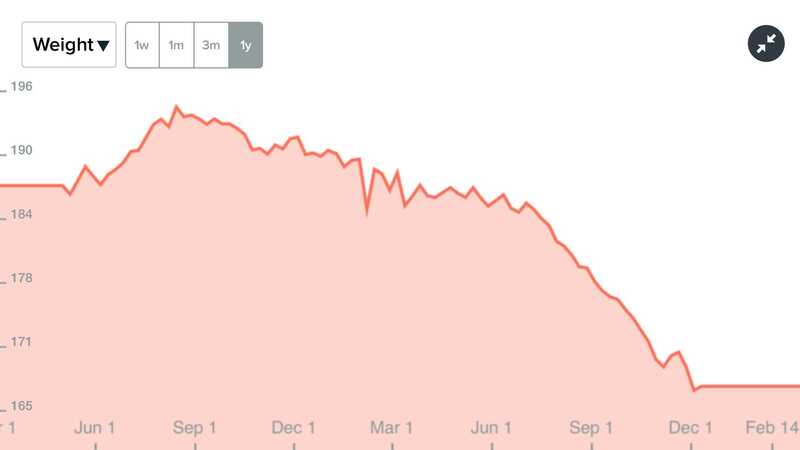 And that was up until about mid 2013 where I kind of hit a new plateau in my weight. And this is looking back at it, I didn’t realize this at the time, I was 195 pounds, I am 6’2”, I have a fairly large frame so I could carry 195 pounds pretty well or at least so I thought. And at that time, this is kind of where the story kind of weaves in. My wife had also had pretty debilitating back pain and a lot of the same symptoms as me which was kind of strange but it was a totally different diagnosis. Her diagnosis is actually somewhat where autoimmune disease called ankylosing spondylitis and there is not too much you can do, you can’t do back surgery for that one. It’s more about inflammation in that case and so there are pretty expensive high intervention infusions that you can do that are similar to the ones that Phil Mickelson is pitching for his rheumatoid arthritis or psoriatic arthritis, I can’t remember which one he has but it’s a pretty similar condition. And it’s just pretty high intervention so you really don’t want to go there unless you really have to. So she was looking for ways to sort of manage her inflammation, manage A.S and she came across a lot of literature on low grain to no grain diets like the gluten-free or paleo kind of diets. And she started working that into; I mean she is the main cook in our family so whatever she puts on the table is kind of what I eat. Paul: That’s what I call spousal diet creep. Jim: Yeah, exactly. Now I was kind of on my own for breakfast so I would… The very first thing that she recommended I cut out was all the breakfast cereals. And so this was, so going back to mid 2013 is where I hit that plateau in my weight. I cut out the breakfast cereals. I went to like a high-protein like eggs and sometimes bacon for breakfast every single day. And now looking back at it and we can pull up the charts on the website at some point but looking back at it I started a steady decline from 195 down to about 185 over the course of about six months and then when my wife really went hard-core paleo like no grains at all; no flour, no rice basically no corn, none of that, I had kind of gone on the bandwagon with her. That was in like a July of this year, that’s when he just started precipitously dropping. So I went like from 184 down to now I am at 165 in the course of like three months. And that’s really had the largest effect on my back pain. I went from… the chiropractic treatment was kind of definitely helping it from an acute standpoint. If I got a flareup I could go get some chiropractor and it would help me out but it would still just come back. And now that I have dropped the 30, 35 pounds, I don’t have all the extra weight on my belly pulling down on my back and making my back muscles tighten up which is just making the bulging disc worse. Now I have gone down to essentially not having any flareups at all or if I do have a flareup it’s a very mild thing that goes away and it lasts for like a couple of days and it’s not debilitating at all. Paul: I actually had similar things. I’ve had flareups when I was heavier but also since I’ve lost weight I still get them but they are far more rare and what I found was my last really bad one, I found walking, believe it or not was the solution for me. And since I have a walking desk, I’d get on the walking desk in the morning and I’d look like some ape dragging my knuckles on the ground. And about 2 or 3 miles in, I’d be straight and pain-free. So you’ve got to find what works for you but it’s amazing how adjusted these simple solutions can really help out. Jim: Yeah, I totally agree. And I agree about walking. That really helps my wife out with her A.S and her inflammation. I have essentially given up running at this point. So I guess that’s the other half of the equation. I stopped burning all the calories but then I changed the diet but really I feel like it’s the input side of the equation that affected my weight the most. But I am still consistently walking about 3 or 4 miles a day at this point. I haven’t switched over to the treadmill yet underneath my stand desk which I do have a stand desk which was part of one of the things I was trying, but I agree with that. Paul: So I just want to talk about seeing the power of the data. And this is what really brings it home for our listeners because a lot of listeners will buy Fitbit or they will buy the Misfit Flash or something like that. And it’s just for fun and they walk a little bit and they kind of look at the charts and it’s more of an amusement type thing. And both of us have discovered that it’s a lot more than that. I mean it’s a narrative and if you look at it you start analyzing it, it’s a story with solutions or with possible solutions to what your issues are. And I think that is very important for our listeners to understand, that although it’s kind of a hobby at the moment, what you are doing is you are creating a new narrative to your story, to the story of your life. And by looking at it, you can make positive changes. So tell us a little bit more about once you started to realize the correlation between the data and what was happening to you, what you did and then we can kind of segue into what you’ve done for all of us which is really amazing; but go ahead. Jim: Yeah, sure. And I was definitely in that first category of people where it was just more of an about the kind of thing and I was collecting the data and looking at the charts every now and then in just kind of a “whatever” kind of deal. Jim: Yeah, exactly. But when you start quantifying it and you have this trail of data that you can go back to that’s totally objective and it’s not just based on – you wrote something down and it was in your diary or something, you don’t know whether or not to believe yourself. Now you can actually go back and look at this chart and be like, “Okay, there is clear inflection points.” So then I could go back and be like, “Well, what happened at that inflection point?” And I could go back and talk to my wife and I would be like, “Is that when you really started doing the full paleo thing?” Or, “Is that when I really started cutting out the breakfast cereal?” And then she can corroborate it. And then once you have the real world human corroboration of what’s going on that chart which is the objective data, then it’s like, “Wow, that really did make a difference.” Because at the beginning of it I was like, “Really? Is cutting up breakfast cereal really going to matter? Like I can’t believe that’s going to matter.” And if I hadn’t captured this data, I may not have believed it. I may not of really even known and then I would be tempted to just fall right back into it and go back and start eating it and then all of a sudden six months later my flareups would start coming back and I would have forgotten about all of it at that point and I would just be back at square one, I wouldn’t have any idea of like what really… How did I go through the six month period where I didn’t have flare-ups. Paul: And this is why when I take people through the LifehackrDiet, the very first thing I have them do is nothing. I have them actually get themselves a pedometer, a digital pedometer and I have them record their week with the digital pedometer. And I have them record their food intake with the diaries that are associated with a lot of these apps. And the reason for that is because most of us really are unconscious when we eat. Most of us are unconscious when we do or don’t do things in our day like taking the elevator inside of the stairs, we don’t even think about it. And so by being mindful all of a sudden of your day and having objective data that also shows, suddenly things come into focus and so I think that is probably one of the most important things, the most important kind of humps you can get over to realize that all of it does matter. Every action you take has an opposite and equal reaction and it affects you in some way. So the point that I really want people to understand and I think you so clearly illustrated is that this new age of quantified self, this new age of collecting your data, it’s important and it’s meaningful and it goes alongside with your photographs and your audio recordings from your life and your home videos because it’s another way of telling your story. And I joked with you when we were talking about this before but when I do something that I am proud of; for example I wrote about this in one of my blog posts and then podcast, “Climbing the chief in Vancouver,” actually climbed the hundred, it was actually 161 flights of stairs in one day, almost killed me. At the end I got a badge from Fitbit that said, “You have won the 150 flights of stairs in one day badge.” And so basically I took a screenshot of that and I put that along with my photos of climbing the chief. And in a way is part of the memory. Paul: It’s a quantifiable aspect of the memory. And you will find that as soon as you can start reading your data and start understanding it, it becomes meaningful. It’s very, very interesting and I discuss that a lot when I take people through LifehackrDiet and try and show them how little things like if you are not getting a lot of sleep… I didn’t know why I was being woken up at like three in the morning every morning. And then I realized it was when one of my dogs jumped on the bed and snuggled right up to me and so now she’s in the basement at night and I sleep better. But these are all the little things but they are extremely important. So let’s segue now into what’s happening; what’s happening in the big picture here with people like Fitbit and Apple. Jim: Yeah, sure. This is kind of where I have that ah-ha moment and then just randomly at the same time, it just happened that Apple was releasing their health app and I saw a news story break that was saying the Fitbit CEO had come out and said, “We are not going to support Apple health anytime soon.” And when I read that, my first reaction was just, “What? !” I mean what happened? Because if you go back to the WWDC conference, they had actually listed Fitbit of one of their like Premier partners that was going to be supporting health in the beginning and I was all geared up and ready for it because I am using my Fitbit for a couple of years now and I am a rabid apple fan and everything was going to be great. Paul: So just if you could take a moment to explain what health kit and what app on iOS 8 does, for our audience. Jim: Yeah sure, I mean I think what Apple is trying to do is there is they are trying to make a one-stop shop for all the various ways that you collect your health data, you can write it all into this secure place, in one place on your phone and have access to it in one app. That way you won’t have to open up 15 different apps to see it all because as you can attest to Paul, you have a trained eye now for these charts. And as human beings, it’s one thing to see all the charts right next to each other and be able to correlate them and see it as sort of a big picture, is how we do pattern recognition and stuff like that. When they are in 20 different apps, you can’t do that. And so I think Apple has the right idea but of course they are competing with Fitbit I guess at this point. At least that’s how Fitbit sees it with the Apple watch although I kind of don’t necessarily agree with that. I think the specs on the Apple watch doesn’t have a pedometer so that’s kind of my big hang up on it and my reason why I still want to use my Fitbit because I don’t always have my phone on my person but my Fitbit is small enough to where I can. So there are huge ramifications to having this data in one place and huge ramifications to being able to share it where you want to. And so we are getting to a point in time… And I have to also just interject that both Microsoft and Google for Android have also built similar projects to Health and Health kit. So this is not going away and it’s only going to get bigger and bigger. Paul: So all right so we’ve got Apple and we’ve got Fitbit and they are locked like two wrestlers not going anywhere. And so what are you thinking? Little leading there, I know. Jim: Yeah, sure. This is not my day job. I actually work as the director of machine learning for a startup company that’s based in Dallas. I was kind of just throwing something together for myself, nights and weekends. I just went to the Fitbit website, I saw that they had an API and I looked at it, didn’t seem like it was going to be that hard. I never built an iPhone app before. I have a Mac so I just downloaded Xcode, bought the developer license, got the Fitbit API key and started writing code. And I actually had a working prototype within about 5 to 10 hours that was working pretty well for me but I knew it was going to take quite a bit more effort to get it polished enough to help other people out and actually release it on the app store. Paul: What’s the app called? Jim: Sync Solver for Fitbit. Jim: Yeah. You can go to [www.syncsolver.com]. Paul: And I will have all of Jim’s information in the show notes so please be sure to head over to the podcast.lifehackrdiet.com and scroll down to the podcast, get all the notes and the charts and all that kind of stuff. So anyway please go ahead. Jim: Yeah. So once we released it mid November, we tweeted it and a couple of the bloggers that had broke a story about Fitbit not supporting Apple and Apple insider picked it up followed by 9 to 5 Mac, Mac Rumors and Mashable and Tech Radar and a bunch of others. And at that point the whole world just kind of got set on fire and just started getting thousands of downloads per hour essentially. Paul: One of them was me! Jim: How did they even find it? How did they even know about it? So I got kind of an inkling there that there may be kind of a pent-up demand for it and as soon as the stories broke it was just the torrent gates opened and since then it’s just been a pretty crazy ride. A lot of great user feedback. We just released a new version that allows the syncing throughout the day. It used only let you get your data up to yesterday and trust me, that’s all part of the issue. There is another issue here with how Fitbit gives us access to your data or I should say restricts access to your data but yeah, it’s been interesting. Paul: So let’s just, if you could just take 30 seconds and just describe in simple terms what Sync Solver does and how it can benefit somebody. Jim: Yeah. So Fitbit has an API and Sync Solver is very simple; you just download it, there is one button in the app. You tap the button, you give it your Fitbit login credentials, tell it which data point you want to allow to read and write in your health app on your phone and then it just goes out and it downloads every piece of data that it can to the finest level of granularity that it can from Fitbit and puts it into Health for you. Then it will just run in the background from that point forward and get all of your new data several times per day. Paul: So basically I’ve had a Fitbit, various Fitbits but I’ve had a Fitbit for two years now. I walked 5,000 miles in the last two years with my Fitbits and up until you came along, 4,950 miles of data and a year and whatever were locked up in Fitbit’s app and I couldn’t get at it other than going to the website or looking at the charts. And by downloading Sync Solver and running it, suddenly all that data came down and went into Health app and is now in my possession. So you have basically freed two years and 5,000 miles of hard earned data to my phone where it belongs. Jim: Exactly and the question is, whose data is that? You bought a piece of hardware from Fitbit granted but you are the one that logged it and the data was about you. Paul: So I’m very curious to ask my audience whether you knew about the situation before or whether you are hearing it first time on this podcast; what do you think about this? What do you think about the fact that these companies that sell you a piece of hardware and allow you to create data, own it and basically control where you can use it or put it. What do you think about that? What do you think should happen? And what do you think about Jim’s response? Jim: This guy who grows smaller every day right? Paul: Just this kind of guy who came up with an idea and hacked it together and why all these big guys were fighting and steaming, he solved the problem. So I love that story from just so many aspects. It’s the quintessential American story of, “You can do anything you want. You can be successful if you work hard if you have a good idea,” it’s that story. But it’s also what I love about what is happening nowadays with all the technology and with the ability to write software is it’s a leveling field. Any 15-year-old kid, anybody can come up with an idea and make something and then thousands or millions of people can benefit from it and I just think that’s so incredible and that’s why I love the era we are living in, it’s just so exciting. Jim: Just to clarify, I am 31. I don’t have two kids and I am 15. Jim: Yeah, I know what you mean. Paul: So again I would love to hear what people have to say in the comment section; that’s podcast.lifehackrdiet.com and let’s get a discussion going about this because in truth, this problem hasn’t been solved. Jim has come up with a really neat patch and clearly all of us think is pretty wonderful but if Fitbit wanted to, they could kind of kill it or make it really difficult for you. Jim: Yeah, in some sense they are still making it difficult. We get access to daily data so we get the total numbers get step counts for a given day but they still won’t give us access to down to the nearest 15 minutes or down to the nearest minute and we’ve had a request in to them for quite a while at this point over a month and they’ve just ignored it. So we’re getting some access. We are enabling you to have access to some of your data but not all of it even still. There is still a ways to go. Paul: So we need everybody out there to voice… Make their voice heard and we need to change this around so that no matter what device you buy, no matter what app you use, your data is your data and I think that’s really important and we are past the 30 minute mark and I swear I could talk to Jim forever about this stuff. There will be this podcast that’s available with the show notes but I’m also going to write a blog post about Jim and I’m going to talk about how he built a solution to his office because I think that’s really interesting. As many of you might know, I am like hard-core and I have a desk and a walking treadmill underneath it. So I actually walk while I work. Jim has found a perfectly good solution as well that works for him and that’s a standing desk set up. So I’m going to talk about how he came to that conclusion and what he’s done and how it’s benefited him. And in 2015 I’m going to be focusing more on standing desks and walking desks and just alternative solutions because I think that this is one of the most important changes that you can make your life because most of us sit all day and it’s killing you whether you like it or not, it’s killing you. Jim: It really does take years of your life. Paul: Absolutely. So I am just going to wrap it up and again Jim I don’t know maybe we should do another podcast or something. I just love your story so much and I would like to honor you today to be an honorary Lifehackr dieter not because you did the LifehackrDiet but you took the same philosophy; you took the same approach, you took responsibility for your health and your wellness. You analyzed your data; you came up with changes to your lifestyle that yielded results that worked for you and you took it to a whole new level. I am doing the LifehackrDiet, you are doing Sync Solver. We are coming at it from different directions but I absolutely completely respect what you’re doing. I think it is awesome and I think we should be part of the “Free your data” movement. And it’s just so important owning this data just like it is owning your photos and your tweets and your Facebook posts but that’s a whole different situation. So I just want to thank you again and wish you the best of luck moving forward. Everybody should go down, go to the iTunes store and search for Sync Solver. Can they get it just through Sync Solver? Jim: Yeah. You just search for Sync Solver or you could go to www.syncsolver.com as the link. Paul: And download this app. Help Jim put food on the table. Help Jim with his mission and help yourself. Jim: Yeah and I would just say let’s try to… I mean the more people that download it, the more Fitbit will get the message. Paul: Perfect. Yeah, absolutely so download it twice. Jim: That’s the real goal here. I mean basically putting food on the table is good but our real goal is a social change. Paul: And I think that’s wonderful, that’s wonderful. So Jim thank you ever so much for being on the LifehackrDiet podcast and again I wish you tons of luck and maybe we will check in with you in a little while. Jim: Great, thanks a lot Paul.